As mentioned in the previous post, when March approaches I get nostalgic. Much of this is brought on by St. Paddy’s Day, since I was raised outside of Boston. I recall it as a hugely anticipated day-long event packed with celebrations, all culminating with aromatic corned beef, cabbage, and all the trimmings. Another much loved food from those days is irreplaceable Boston Brown Bread, a must have accompaniment with famed Boston Baked Beans. Whenever I see a brown bread recipe, I automatically save it. I’m not sure why I collect them, because there is nothing complicated about it: just a basic bread using baking soda for leavener, with a combination of hearty flours like rye and wheat—and of course cornmeal. Buttermilk is the standard liquid, and molasses is a key ingredient which supplies mild sweetness along with its signature flavor. Raisins or currants are negotiable. 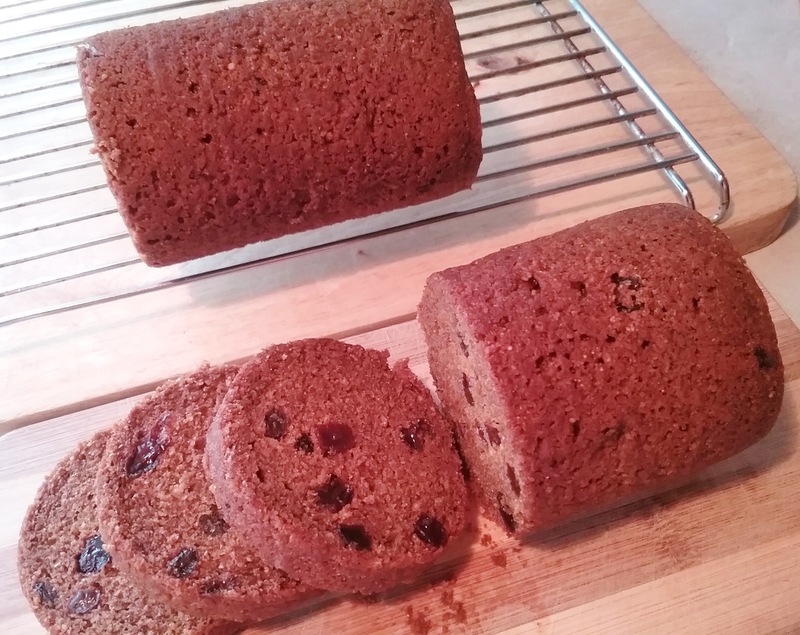 Boston Brown Bread is a quirky boiled/steamed bread with a history that likely goes back centuries. In more recent times, the practice of using a coffee can as a cooking mold has become linked with its now characteristic round shape. I must confess until this March I had never made Boston Brown Bread. I may have been caught up in its mystic, but the idea of boiling bread in a water bath for an hour just seemed a little too remote. That is all pre-multi-cooker. Now, I am so smitten by the Instant Pot’s flexibility that I seek out challenges—and what a ride it gave me this past weekend. Most certainly the IP was created for Boston Brown Bread. 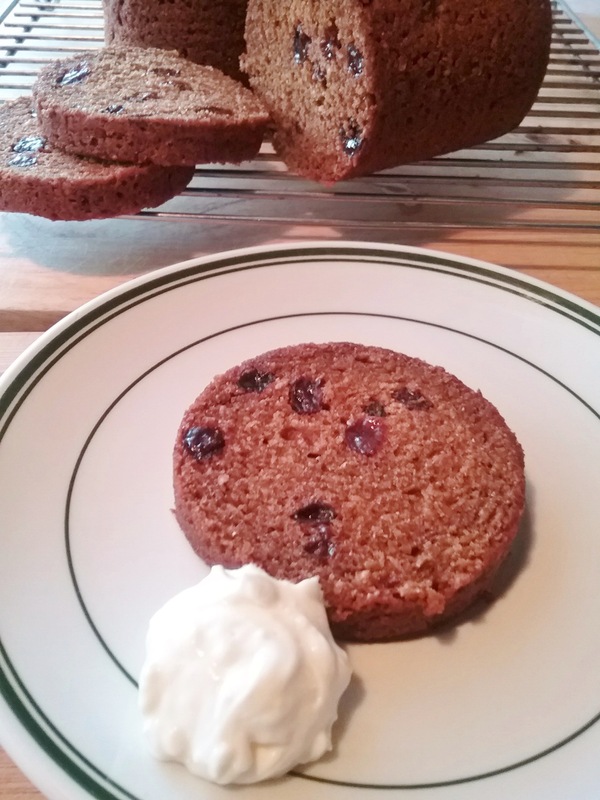 This is inspired by Jasper White’s Boston Brown Bread recipe, which I have adapted to the PC. The batter is divided between two 15 ounce pinto bean cans. It’s a good idea not to fill the tins any more than 2/3 full to allow for rising space. Cover them with foil and secure with twine. In 30 minutes, the loaves are ‘baked’ and beautiful. I will not gush, but will simply state that this is a bread worth investing in a multi-cooker. It is just as good as I remembered! Brown bread is great warmed in the morning, spread with butter or cream cheese. It makes a great mid-day snack, an accompaniment to many entrees, and it is lip-smacking good as an ice cream sandwich. Grease the insides of two cans with butter or baker’s spray. In multi-cooker, insert trivet and pour in about 6 cups water. Set pot to Saute or Simmer to begin heating the water. Combine the dry ingredients with a whisk in a mixing bowl. Stir in the liquid, then fold in the raisins. Divide the batter between the molds. It should fill molds about 2/3s full. Secure the tops with foil and tie with twine. Place the cans into the pot, adding more water if necessary to fill ½ way up the sides of the cans. Do not fill the pot beyond maximum capacity mark. Set to High Pressure and cook for 30 minutes. Allow bread to rest in pot with lid sealed for 10 minutes then slowly release pressure. Test for doneness: a skewer inserted in center should come out clean. Transfer molds to cooling rack and remove the foil covers. Cool for about 45 minutes before unmolding. Yield: 2 loaves.